DICE AGE Glacial pacing and prehistoric jokes keep this story about four fossils throwing a bachelor bash from hitting the comedy jackpot. You read a lot about the battle between digital and celluloid, but little about the format that’s rapidly becoming dominant in Hollywood: Geezerscope. Mark my words, the day is approaching when every title in the top 10 will be a bittersweet comedy with a cast of one-time action stars hobbling around on walkers. Actors have always aged in front of the camera, of course. It’s provided occasions for especially moving and memorable work. I’m thinking of John Wayne in True Grit, Henry Fonda in On Golden Pond, Spencer Tracy in Guess Who’s Coming to Dinner (completed 17 days before he died). I am not thinking of Arnold Schwarzenegger and Sylvester Stallone in Escape Plan. Somewhere along the way, the industry forgot what to do with performers who’ve passed their prime. Instead of going deep, it decided to go cute and comic. The result has been a couple of decades’ worth of films that mostly fall into one of two categories. On the one hand, pictures such as Venus, Quartet and Another Year offer relatively realistic looks at life’s last chapters. On the other, movies like The Crew, Stand Up Guys and — the bottom of the genre’s barrel — The Bucket List present a comic-book vision of old age as an enfeebling fantasy one can snap out of, given a reason wild and crazy enough for doing so. 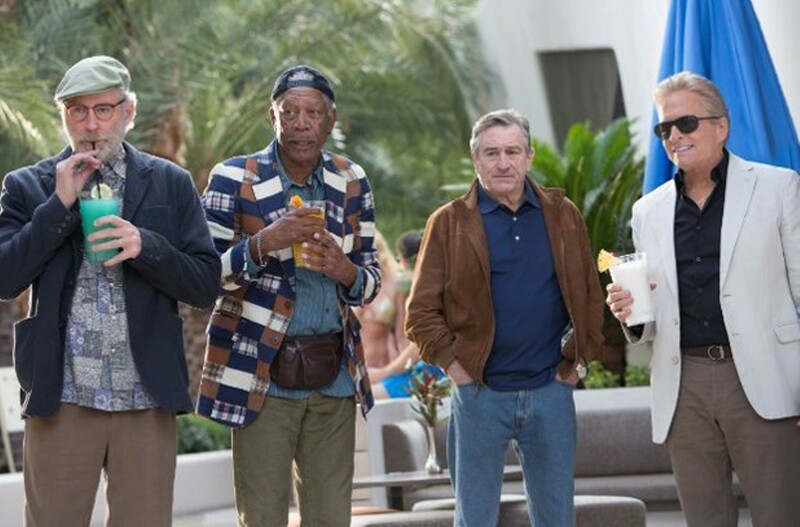 Last Vegas is Hollywood’s latest contribution to the latter school. 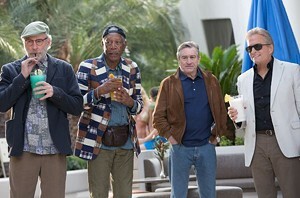 Directed by Jon Turteltaub (National Treasure) and written by Dan Fogelman, it’s a geriatric riff on The Hangover. Minus, you know, the tiger, the roofies and the laughs. It’s official — Robert De Niro, 70, will do anything for money. The artist formerly known as an artist is this close to playing a grumpy neighbor on a sitcom. As Paddy, a grumpy Brooklyn widower, he’s initially the holdout when his old gang decides to throw a bachelor party for the only member who’s yet to tie the knot. That’s a business big shot named Billy (Michael Douglas, 69) who’s marrying a hottie half his age. There’s Kevin Kline, 66, as Sam, a generic Sunshine State retiree; and Morgan Freeman, 76, as Archie. It’s essentially the same role Freeman played in both Red and The Bucket List: a half-embalmed coot who inexplicably has the energy and moves of a 20-year-old when the plot needs him to. The four meet up in Sin City and proceed to “party like it’s 1959.” I’m not sure what’s supposed to be funny about that line, but I can say with certainty that things don’t get funnier. How lame and predictable is Fogelman’s script? I sat down, checked my watch and awaited the first Viagra joke. The wrapper wasn’t off my straw when it arrived. Paddy and Billy, who fell for the same girl when they were kids, now — you guessed it — fall for the same lounge singer (Mary Steenburgen). Archie wins a fortune playing blackjack, so management comps the friends a palatial suite, the perfect place for an epic bacchanal where life lessons are served with the martinis. As though the filmmakers feared they might’ve skimped on shtick, the final act contains not one but two proofs of my oft-referenced Movie Pool Rule. Namely, the laws of Tinseltown physics demand that, if there’s a pool in a scene, someone must fall, slip or be pushed into it. In Last Vegas, no fewer than two Oscar-winning actors are pushed into pools within minutes of each other. There are five Academy Award-winning actors in the cast — so, technically, the movie could have been stupider. But not much. In the case of this lazy, laugh-free comedy, what happens in Vegas shouldn’t just have stayed in Vegas; it should’ve stayed in Fogelman’s word processor. Somebody get me a roofie. * Running time: 105 min.